I hope you like this one better than my first one. I�m getting better but still not quite there. 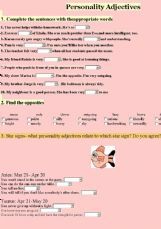 SS fill in a chart. Ss choose the correct form of adjective. Ss compare objects. Enjoy ;-) Orit. 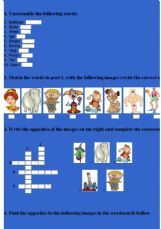 easy worksheet about basic adjectives for young learners.. 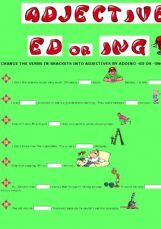 Fully animated exercise to practise adjective endings (ed/ing)in context. Really hope you can use this in class. An introduction to ADJECTIVES. In this delightful video from School House Rock, we will �unpack our adjectives� to describe our camping trip. Really a fun video clip - enjoy! I love playing with pictures! This is for young learners. 30 sentences to test how your ss have acquired degrees of comparison of adjectives. A ws is also available in today�s contributions.